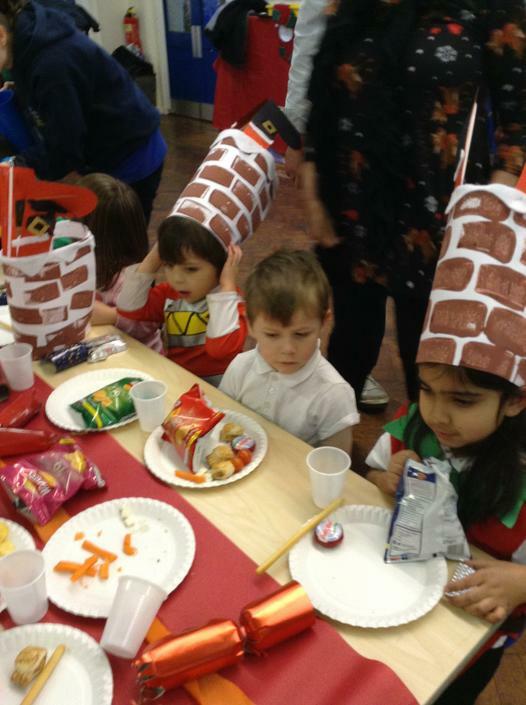 It was a very festive day in the Burnaby Hall today. 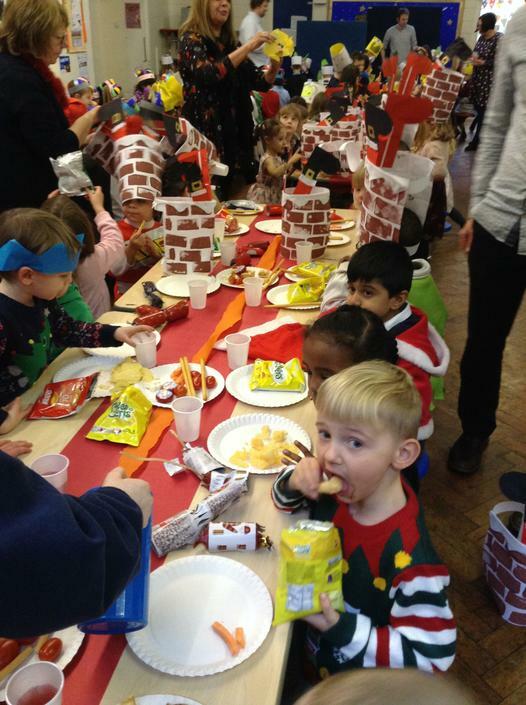 It was jam packed full of extremely hungry and very jolly children all excited for Christmas Dinner. The lovely dinner staff had decorated the tables and there was some Christmas music playing to get us all in a festive mood. 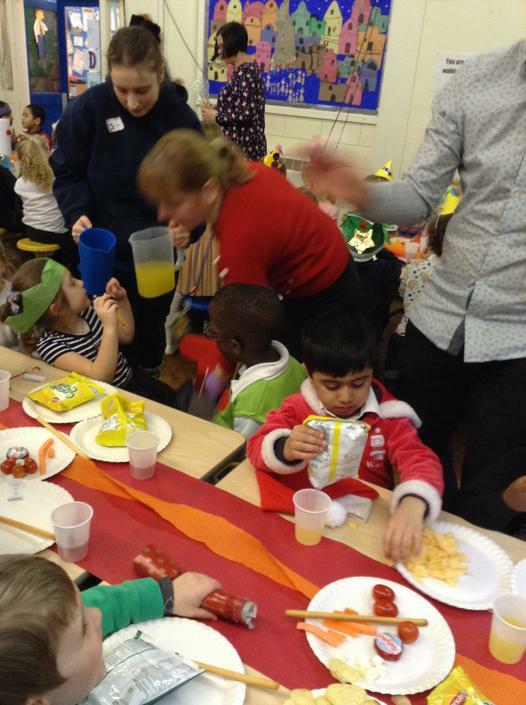 The staff joined the children at the tables. 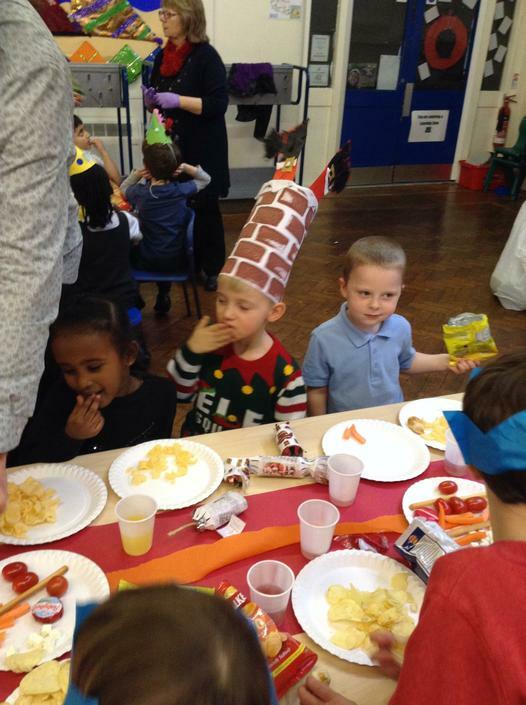 Everyone looked fabulous in their Christmas hats. 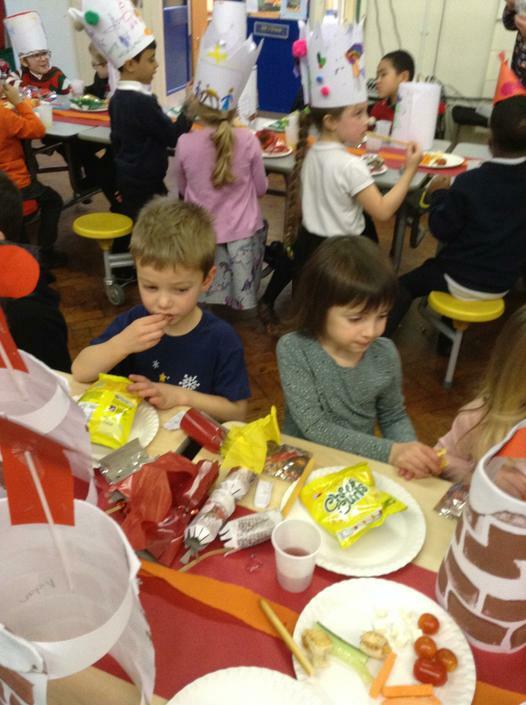 We had roast turkey or quorn, potatoes, carrots, sausage, gravy, stuffing and of course, brussel sprouts! For pudding we has a reindeer crispy cake, yum yum yum! Thank you to our lovely Kitchen staff for cooking a lovely dinner and for everyone else who helped serve and look after us. 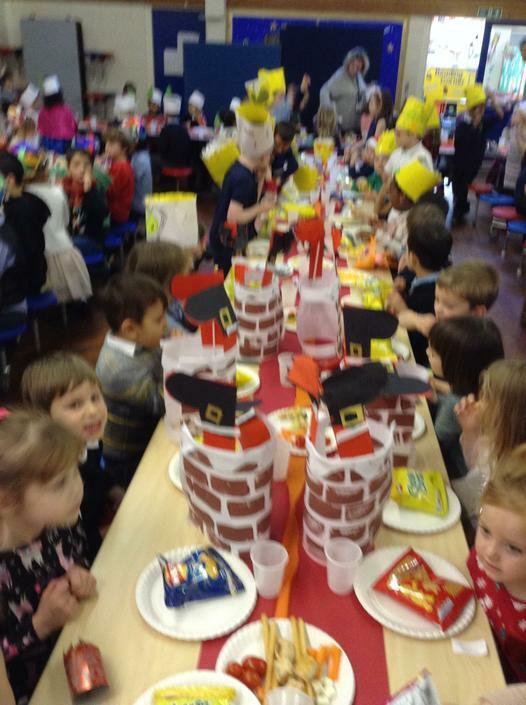 What a fantastic party!!!! 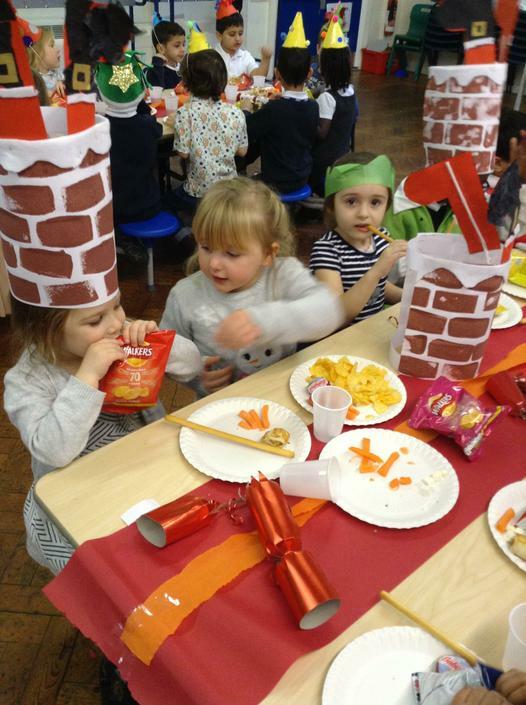 We played pass the parcel, ate a banquet and danced the afternoon away! Thank you for your contributions of food.. let's just hope that no one is sick!! 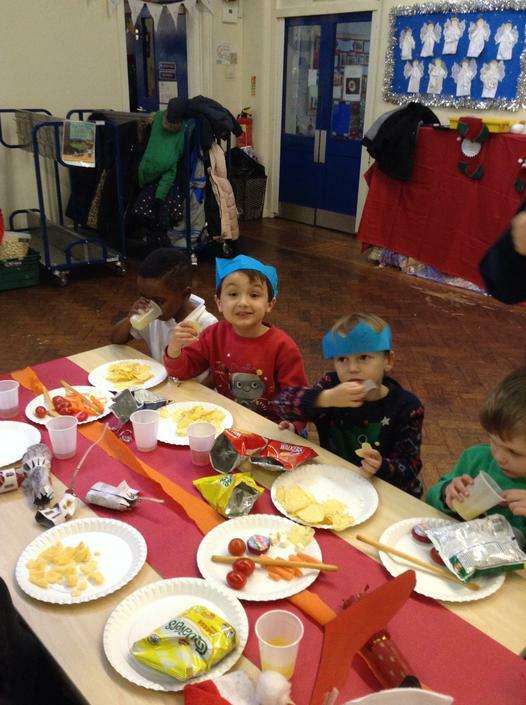 The children amaze us everyday but the last two days have been extra special. Not one but three amazing performances of our Christmas play. First, dress rehearsal in front of KS1, Y5, Y6 and special guests. 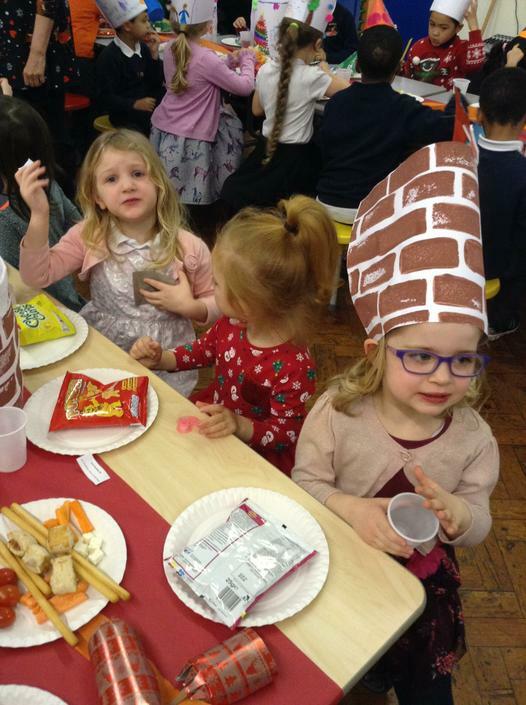 Then a morning performance in front of nearly 100 parents and finally an afternoon performance full to bursting with exciting, nervous and sometimes even weeping parents! Everyone was amazing! From the animals in the stable (complete with sound affects), to the funky dancing angels, the organised innkeepers and their guests, the parading kings and camels, the sleepy shepherds, the adorable donkeys, the excited children, the eloquent narrators, and... the story wouldn't happen with out Mary, Jesus and the donkey. 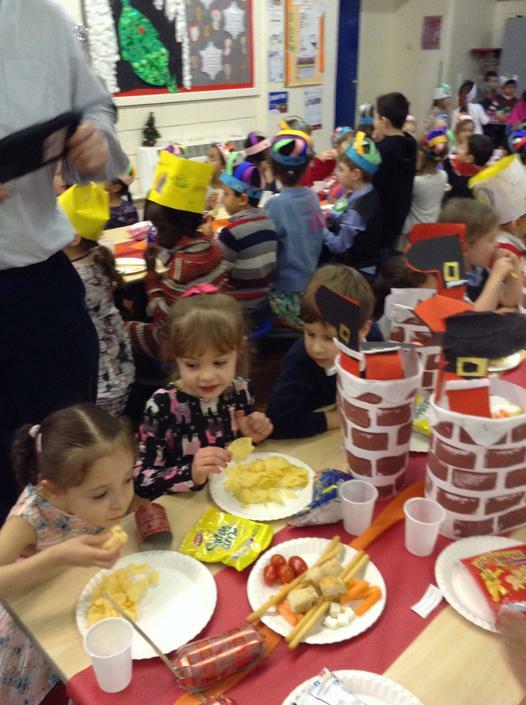 Well done to everybody including all the parents and guests for being such a fabulous audience. Ready for the show to begin! Week 5 - Birthday Celebrations!! This week we learnt about Birthday Celebrations!! We started the week by reading a book- Kipper's Birthday. Next day, we received an email from Kipper asking to help him organise his friend Molly's birthday party. We started by preparing a Birthday party-do-list. We were busy writing a shopping list for the things we need to buy for the party. 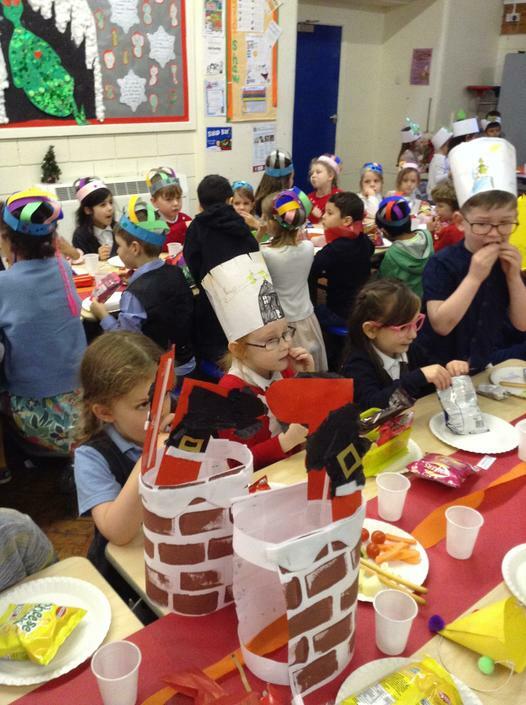 We also made party hats which looked so colourful and pretty. We coloured birthday cakes and balloons on activity sheets. We wrote invitation cards. Towards the end of the week, we discussed how are birthday's celebrated differently all over the world. We also made a 'Happy Birthday' banner. We are really excited and looking forward to celebrated Molly's birthday next week! This week in Maths, we learnt about money. We learnt to recognise 1p, 2p, 5p, 10p coins. We know exactly which coins are bronze and which coins are silver! Towards the end of the week, we were confident in sorting the coins in the right group. This week we have been learning about friendships and what makes a good friend. We also listened to the story of DIGI duck who finds an embarrassing photo of his friend. He decides to email the photo to all of his friends. We discussed whether this was a good idea and something that a good friend would do. Then we made posters to help illustrate a friendship poem that we have learned as a class. 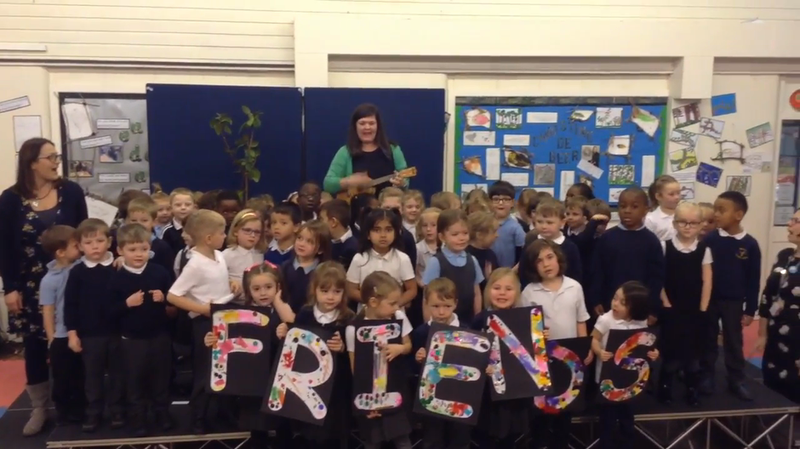 We are going to perform the poem along with a song about friendship in assembly next Monday. Our song is ready for assembly next week. We hope you enjoy it as much as we did. What a brilliant day we had at the Showroom Cinema for the into film festival. We arrived at school early so that we could make it to the tram on time, and we did with 3 minutes to spare, hooray! We wore very bright vests so that we could be easily seen and be safe on our walk to the tram. The tram driver and conductor were very helpful and they helped us get everyone off safely. Thank you! Then we had to cross the tram track carefully and walk through the station, unfortunately there were no trains to wave at. Then we walked past the water fountains to the cinema. All the staff at the showroom were so helpful and kind. There were several other schools there too. We settled down to watch the film - Maya the Bee: The honey games. We had little bags of popcorn and a drink. After the film we came back to school and ate our lunch. 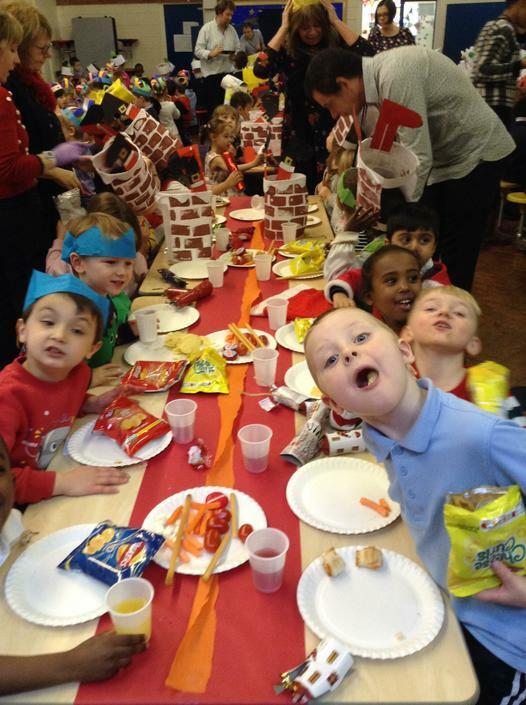 The children were fabulous. Lots of people said so, what lucky teachers we are! Well done everybody! On 11th November it will be 100 years since the end of World War 1. We looked at an information book about remembrance day and we talked it about why it is important to never forget. We talked about why people wear poppies and we made a giant poppy wreath to hang on our door to remember all the soldiers and people that have given their lives fighting in wars all over the world. This week we are learning about the Hindu festival of light -'Diwali'. 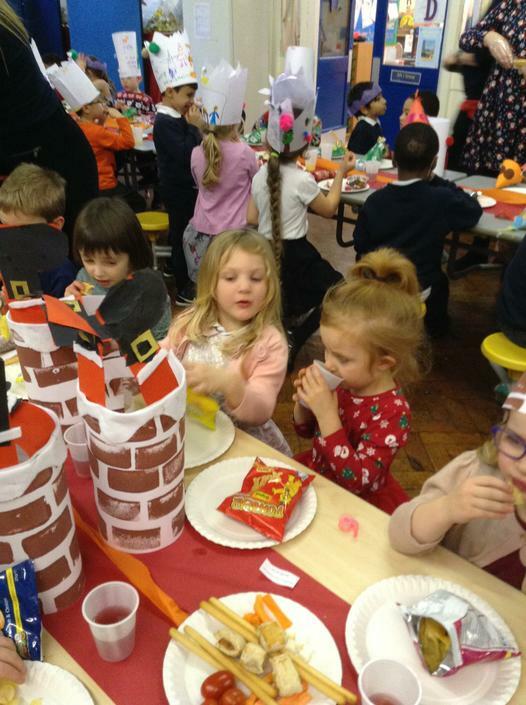 We are very lucky because Mrs Bakshi our PGCE student celebrates Diwali with her family so we were able to here a real life account of how the festival is celebrated. We made rangoli patterns with flowers, shells and stones. In maths we counted out sequins to match the number on the stars. We moulded salt dough with our fingers to make Diya lamps. 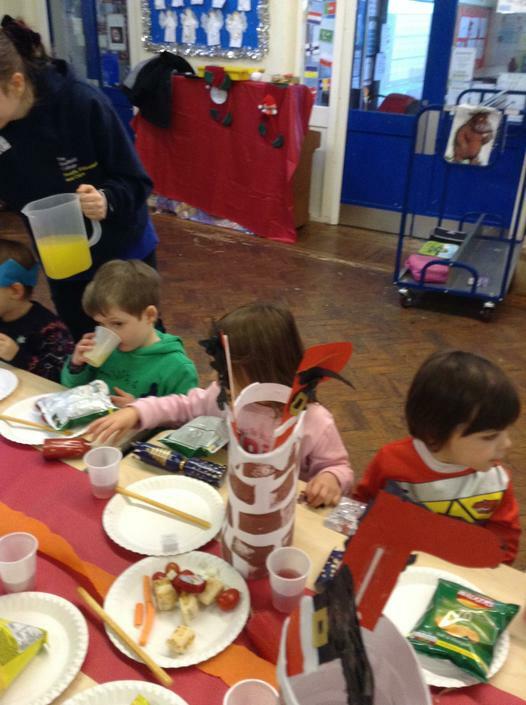 Then we painted and decorated them with bright colours and sequins. 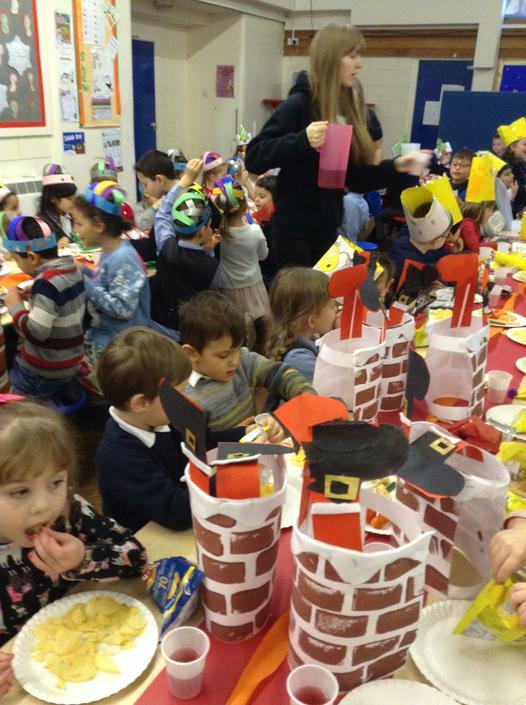 In our first week of Autumn 2 we talked about Bonfire Night. We watched a video of a fireworks display and talked about own own experiences of fireworks. We described fireworks using our senses. We made firework collages with a range of materials and wrote lists of firework words. In maths we learned about height. We made the tallest rocket we could in 30 seconds and then compared it to the other rockets in our group and worked out which was the tallest and which was the shortest.